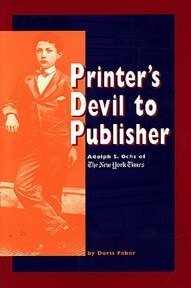 Published as part of the Times's centennial celebration, and written by a former Times reporter, Printer's Devil tells the dramatic and little-known story of how a struggling young man from Tennessee bought the nearly bankrupt New York Times in 1896 and transformed it into the best and most powerful newspaper in the world. A lively, readable biography of a barefoot boy who rose through the ranks of the newspaper business--from printer's errand boy, to printer, to publisher of a small Tennesee daily, to a position of enormous power and influence, competing with the likes of Joseph Pulitzer and William Randolph Hearst, and consorting with presidents. With an introduction by Arthur Ochs Sulzberger, current chairman of The New York Times and grandson of Adolph Ochs.